There´s a strong focus on making fashion clothes more sustainable with a longer lifespan. But what happens if you turn the argument around? 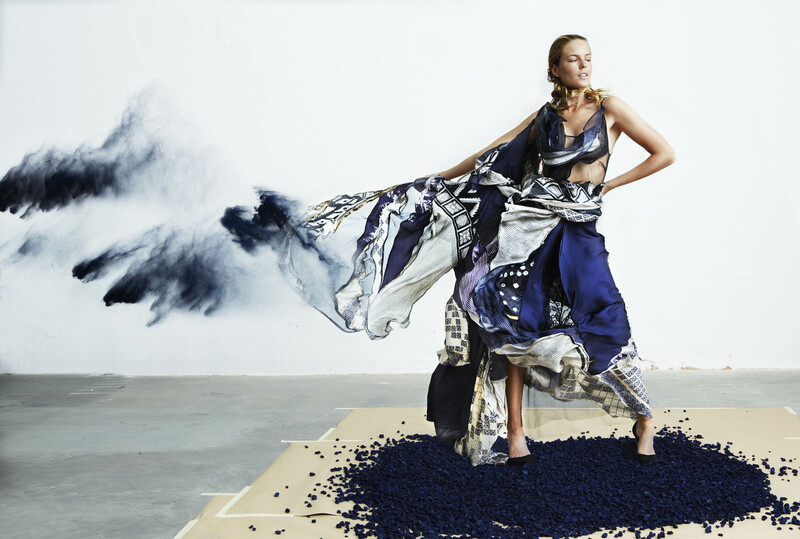 Can throwaway fashion become the greenest alternative, if it´s made in biodegradable material? Could clothes that deteriorate turn the problem of overconsumption and at the same time raise existential questions? "The new world hunger will never leave you," sang Joakim Thåström and Imperiet in the eighties. Perhaps it is time to accept this hunger as something more than human, and instead of denying it, curse it and, after half a century of stigmatising, embrace it? Most of the environmental impact of our clothes today takes place after manufacture. We are researching textile materials that are made from 100 per cent compostable materials like cellulose and milk proteins. Innovative materials that have the same characteristics and flexibility as cotton or silk. The fashion and textile industry is constantly looking for materials that last long and with a lifespan comparable to cotton, but what would happen if we took the opposite approach? If we produced garments that are wearable for only a short time, and then returned to the cycle? These fleeting clothes, these flowers of the day, will soon be fully possible to produce, and the manufacturing process would be much cheaper than knitting threads. Garments that age could also raise the issue of a society that is not based on the same consumption patterns that we see today. The textiles look the same as what we are used to, but just for a shorter time, before they decompose. By investing in perishable consumer goods with short lifespans, there are now opportunities to create a fashion world in which fast fashion and wear-and-tear goes from being regarded as the industry's weakness to being something positive for both consumers, businesses and the environment. Clothes that are like good food. They cannot be owned, but rather experienced, and they can show us a renewable world based on transience instead of the all too prevalent notion that things should be produced to last. In a society where the future is anything but bright, it is also time to bring fashion out of the museums, to where it is all to often dismissed, and show a possible future in which social issues and fashion aesthetics can meet again. The great advantage with compostable clothes is not only that they are much cheaper to manufacture, but also that they intuitively embrace the progressiveness and consumption habits that the fashion industry is largely based on. Glancing at the value chain of a garment, and its possibilities of being manufactured on site and on demand, the economic opportunities are astonishing. Materials that need not last long may perhaps not require long transports or marking down. For a forestry industry that is thirsting for new markets, it should be quite an attractive vision. In his book Yes is More from 2009, the architect Bjarke Ingels suggests that we must leave the neo-Protestant notion that sustainability must hurt, be dull, and that we have to stop doing all that we enjoy. We should embrace all aspects of being human, and find alternatives to keep doing what we like, but in other ways. In this way, we create a better society without a constantly bad conscience. So will we soon be able to consume as much as we want, while keeping a more playful and carefree approach to how we dress? Perhaps as consumers, we can finally buy the extravagant clothes that we may only want to wear once or twice and then never again, without a guilty conscience. Clothes that, like windflowers in spring, also remind us of our own impermanence. Here, the vision may be just that, only a vision. But it does go a long way. We must dare to look ahead and question and re-evaluate the actual premises of our society and its systems without condemning, limiting or even comparing it with old habitual behaviours. The renewable society demands that we stop changing trends and instead start changing structures. We cannot keep running in place, longingly looking over our shoulder. We need visions, both in fashion and in society.